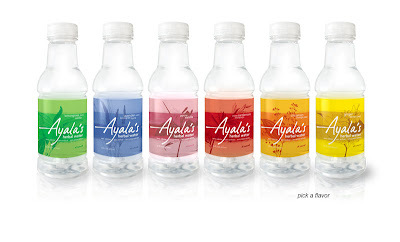 Introducing Ayala's Herbal Water; a "naturally enhanced flavored water". Flavors include: Lemongrass mint vanilla, lavender mint lemongrass thyme, jasmine vanilla, cloves cardamom cinnamon, cinammon orange peel and ginger lemon peel. She's Dr Ayala Laufer Cahana, a pediatrician and medical geneticist from Wynnewood Pennsylvania and she also writes her own blog on nutrition. Peeking at her blog she seems to be all about evidence-based medicine as she links back to studies on the safety of vitamin supplements, nutrition and cancer, diet soda and many more. "The new water is all natural, has zero calories, zero artificial additives and zero preservatives, and features the complex and sophisticated flavors derived from herbs which also bring all the health benefits associated with antioxidants." "For centuries herbs have been enjoyed around the world and are known for their healing powers. Some of the herbs used in producing the Ayala's Herbal Water have been known to aid digestion, improve blood glucose levels, strengthen immunity, reduce insomnia, stress, and help maintain healthy LDL cholesterol levels." Her ads also tout the fact that it was, "created by a pediatrician". Now I'm all for water and have nothing against herbs, but it strikes me as more than a tad hypocritical, exceedingly misleading and an abuse of public trust to use your MD to promote water with a smidgen of herbs as being something specially formulated by you with explicit inferences that the herbs infused will help improve multiple medical conditions. Worse still coming from a doctor whose blog at least suggests, understands the astronomical difference between evidence and inference, yet seems to be relying on the fact that most consumers don't to sell her product.